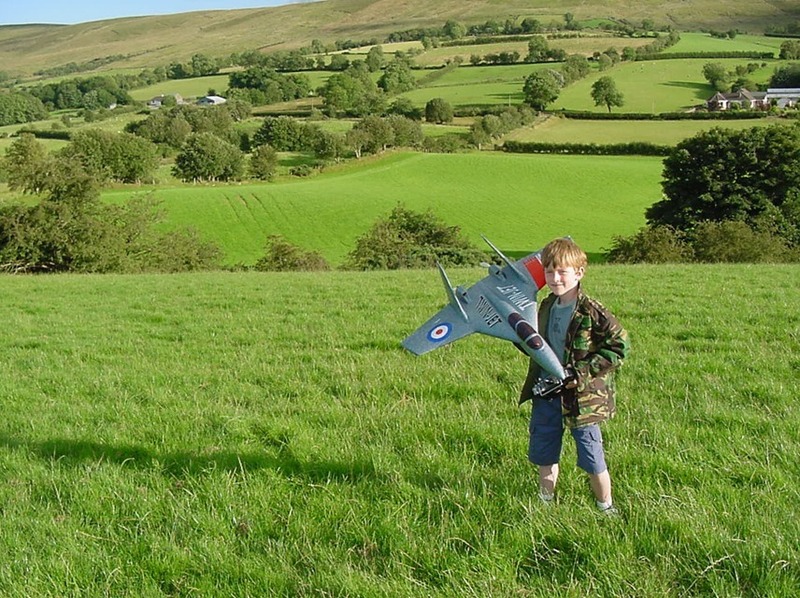 Cranfield University Blogs | Agrifood on tour: bringing science to life! Throughout the year my Agrifood team and I travel around the world to raise awareness of Cranfield’s research and teaching expertise. Central to this is our participation in outreach activities, and this year has been no exception; we have attend events both nationally and internationally, and it’s great going out to meet potential new students, young and old. One of the most exciting outreach experiences we’ve had this year was our visit to Sharnbrook Primary School (previously known as John Gibbard Lower School). 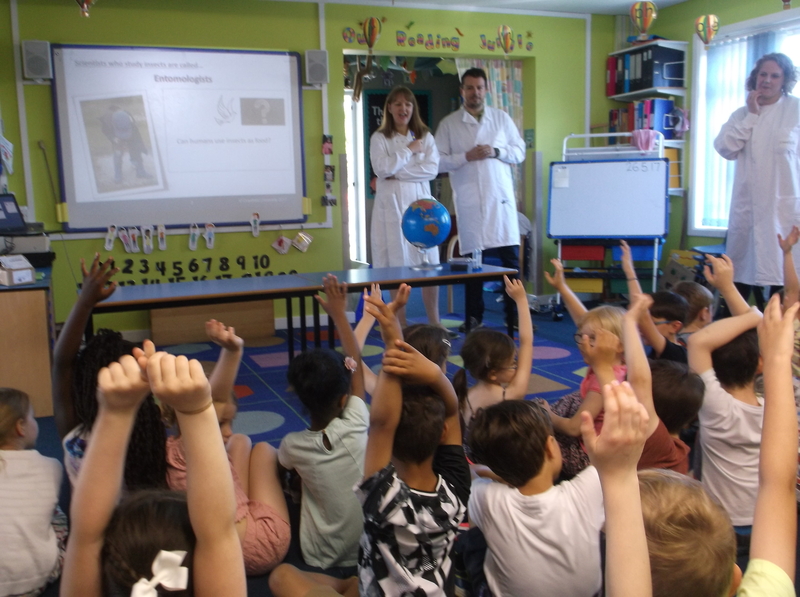 Dr Sandra Messenger (a STEM Ambassador), Natalia Jawiarczyk and I went to talk to the children in Year 1 about the Innovate UK Insect project that we’re working on. The students were studying the topic of insects at the time so they were really engaged. We got them to wear lab goggles, gloves, grind fly larvae and look at them under a dissecting microscope. We also showed them some hissing cockroaches, just for fun! These school visits help us to increase the awareness of the role agriculture and food will play in their lives, regardless of whether they are working or studying in the sector in the future. Connecting with our younger generation, and alerting them to the challenges we face, is essential if we are to attract the best and brightest students. And undoubtedly this is what we must do: with the global population expected to hit 9.8 billion by 2050, we’ll have a lot of mouths to feed in the decades to come. Part of connecting with our younger generation is done through the Erasamus+ action project. The Erasmus+ is the European Union’s funding programme for education and training, youth and sport. The overall programme aims to boost skills and employability; modernise education, training and youth work; and improve opportunities for young people. Earlier this year I participated in an Erasamus+ action project in Austria. During my time there, I was teaching at the University of Natural Resources and Life Sciences, Vienna (BOKU) as part of the teaching team of the Mycotoxin Summer Academy 2017 Module I. This was a great occasion to experience the Austrian teaching style and meet some great people from industry. I also pursued the opportunity to strengthen research collaboration between the Cranfield Soil and Agrifood Institute and BOKU. We are now having discussion with BOKU academics for future projects together, which is a fantastic outcome. At the end of my stay in Austria, I was as an invited speaker at their annual ‘Mycotoxin Summer Talks 2017’ conference, where I delivered a talk on our world-leading research in mycotoxins. As well as helping educate younger generations, we educate the older ones too. 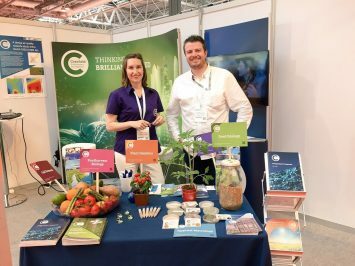 My team and I attended edie Live at the Birmingham NEC (photo right), which gave us a chance to network with prospective students, sponsors and partners. These types of events are a great opportunity for us to answer questions and discuss future problems, as well as showcase the work we are currently doing to find solutions. And it’s great when this leads to people being inspired and joining us on this journey! This can result in future partnerships for both the University and student projects. Unsurprisingly, our group projects always generate a lot of interest and questions. For those who don’t know about them, Cranfield University group projects are consultancy-style projects, usually sponsored by industry partners. They provide students with experience working on real problems for a real client, gaining essential technical and transferable skills, such as team working, managing resources and developing reporting and presentation skills. Our sponsors and partners are important to us for these projects, as many of the projects are supported by external organisations and the experience gained is highly valued by both students and prospective employers. 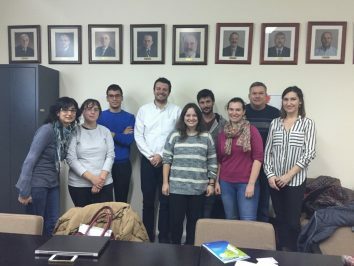 We also like to take every opportunity to network, which is why we visited some of our European Partnership Programme partner universities including University of Lleida (photo below of Dr. Mari Carmen Alamar and I at Lleida University with Dr Isabel Odriozola (far left) and potential students from Lleida), Polytechnic University of Valencia, University “Cardenal Herrera CEU”, and Universidad de Santiago de Compostela. 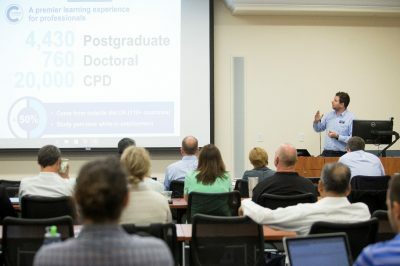 Building bridges with universities around the world is so important in this era of internationalisation of higher education – it not only means we can share knowledge and collaborate, but also gives prospective students an idea about the very specific, industry-focused work we do here at Cranfield. Sharing our knowledge can help create more solutions to the world food problems we face. 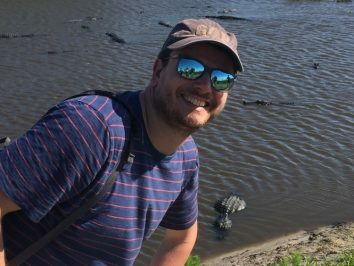 In my role as Programme Director for the Agrifood MSc course programme, I visited the University of Florida for the International Agroecology Summit, with the aim of increasing the relationship between our institutions. It was a great summit, but more importantly it has significantly strengthened our relationship with the institution, and as such what we can offer to our respective students. We have also been involved in the development of new partnerships with higher education institutes in Korea, China and Thailand. This region of Asia is very important to us – we receive a great number of students from those countries already, and with that we are building bridges for the decades ahead as we work together to solve the growing problems facing our sector. We’re always doing our best to increase our relationships with other institutions but when we do get five minutes of spare time we make the most of it! While I was in Florida I visited five research centres in a bus tour of more than 600 miles, until we finally arrived at the main campus. As result of the visit we are now a part of the International Agroecology Consortium. I also visited Mexico to strengthen the relationship with students there, and I spent time interviewing prospective students and also meeting alumni from Cranfield. It was a great experience as they showed me the most important areas of their city. As part of our international activities we aren’t always the ones travelling, we also meet people here at Cranfield. 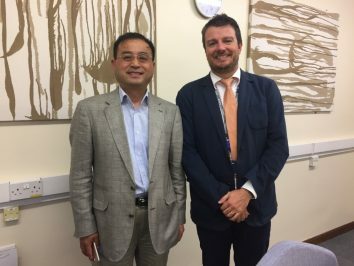 One example is Professor Jainshe Chen who is the Associate Dean for International of the School of Food Science and biology, Zhejiang Gongshang University (photo below). So all in all, a busy year, with many miles covered, and many new and old friends met. But more importantly, time spent with the next generation, alerting them to the food challenges that we will all face as the global population continues to rise. But also telling them about the fantastic and rewarding opportunities that arise from working together to tackle those challenges. Soon we will be meeting our latest cohort of agrifood students here at Cranfield, as they come to learn about and help advance our expertise in the area, and I can’t wait to get started! It’s going to be another busy year, but that’s the way we like it!! Dr Medina obtained his PhD degree in Microbiology in 2007 at the University of Valencia. Subsequently, he worked in the food industry until he obtained a post-doctoral grant from the Spanish Ministry of Science and Innovation to work in the Applied Mycology Group at Cranfield University (UK) from January 2009 to August 2010. During this post-doctoral training period he applied and was successfully granted a Marie Curie Individual Fellowship (Intra-European Fellowships for Career Development) to develop the project “Mechanism of action of antifungals against mycotoxigenic species: from molecular to phenotypic efficacy” (PIEF-GA-2009-253014) (September 2010 to August 2012). He was then part of the Applied Mycology group as Research Fellow until October 2013. 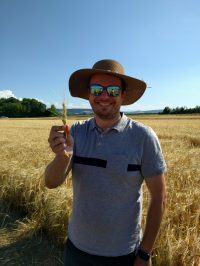 Dr Medina-Vaya re-joined the Applied Mycology group (September 2014) in the new Cranfield Soil and AgriFood Institute where he is currently leading international quality research in the remit of mycotoxigenic fungi and climate change. He is also developing projects for industrial partners. In 2015 he was awarded the Recognised Teacher status by Cranfield University. Dr Medina was promoted to Lecturer in Food Mycology in early 2016 and is now directing the Agrifood MSc course programme.